Welcome to the River House Restaurant. Winner of first-place awards at Portsmouth’s Prescott Park Chowder Festival three years running. Voted “Best Chowder in New England” by NECN viewers. 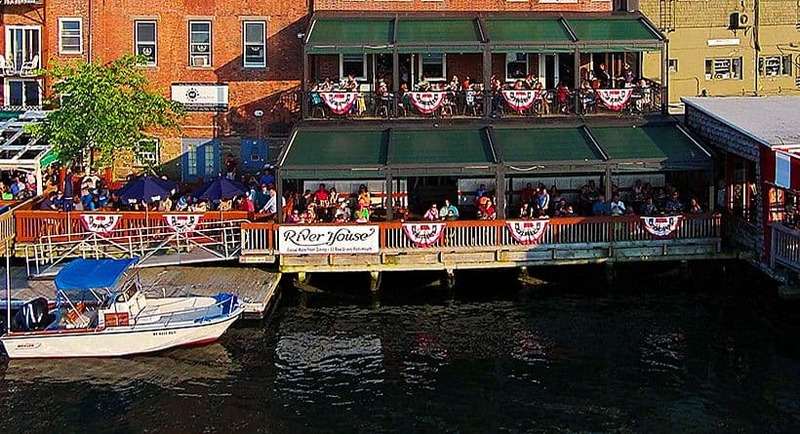 The River House features classic seafood favorites complemented by contemporary dishes served on our decks and dining rooms overlooking the Piscataqua River. Open daily at 11 a.m. Outdoor Dining:Our heated balcony is open and has among the best views of the tugs and Portsmouth Harbor. Private Room:Private Second Story Function Room overlooking the Historic Tugboats with private entrance and special menu available for seated events up to 36 and cocktail parties for up to 49 people. Takeout:Most of our menu items are available for takeout.